Bhubaneswar: BJD President and Chief Minister Naveen Patnaik today announced candidates for nine more Assembly seats and one Lok Sabha constituency. 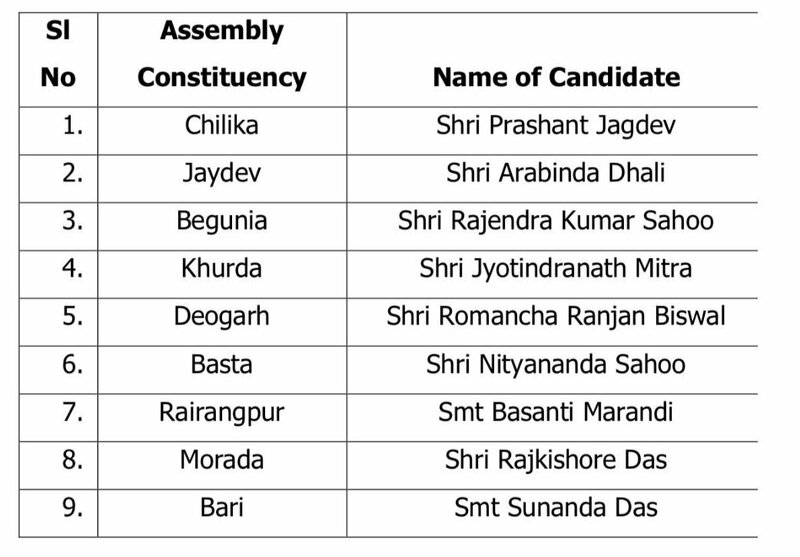 While Arabinda Dhali will contest from Jaydev, Prashant Jagdev will fight from Chilika, Jyotindra Nath Mitra from Khurda, Rajendra Kumar Sahu (Begunia-Bolgad), Raj Kishore Dash (Moroda), Nityananda Sahu (Basta), Romancha Ranjan Biswal (Deogarh), Sunanda Das (Bari) and Basanti Marandi in Rairangpur. Patnaik also announced the name of Bhartruhari Mahtab for the Lok Sabha seat today.